The Buffalo Sabres have officially been eliminated from playoff contention, following a 4-2 loss to the Flyers on Thursday night! For the second season in a row, their elimination comes at the hands of the Philadelphia Flyers, only difference is last year the Sabres made the playoffs. Ultimately fans all knew this moment was coming and were just denying the inevitable, last weekend’s two losses in which they failed to get a point proved costly. It’s been quite a season for the Sabres and their fans, full of heartbreak and excitement. From the preseason hype that had the Sabres in the playoffs and Ryan Miller winning the Vezina before the season had even started. To the Milan Lucic hit, which really threw Miller for a loop. From having 9 starting players injured to the discovery of the Tyler Ennis line. Who could forget the cinderella story that seemed to good to be true, when the Sabres turned around their game mid February climbing out of 15th all the way back to 8th (for a little bit). A lot of the success the Sabres enjoyed in the second half came from Ryan Miller. He was able to turn around his .899 sv% (pre all-star break) to a .935 sv% Post all-star break! He led the way with 31 wins and a career high 6 shutouts (5 of them post all-star game), he was stellar and the Sabres playoff hopes relied heavily on how well he would play to close out the season. As Miller goes, goes the Sabres! Miller and the Sabres ran out of steam, the burden to make the playoffs after their poor start was just too great to bear. But they gave it their best shot, they left it all on the ice and never once gave up hope or quit! Making up a 10 point deficit going 20-7-5 in the last 32 games, which proves when the Sabres are healthy they’re a very scary team to play. A rough start followed by a slew of injuries saw the Sabres fall to the bottom of the Eastern conference, by the time they woke up and started to play the type of hockey they were capable of it was too late! After a rough start to the season and a stint on the injured reserve, Ennis really bounced back and took his game to the next level in the second half of the season. He was crucial to their turnaround. He racked up 27 points (11 goals + 14 assists) in his last 24 games and really helped calm down and get his line mates producing. Ennis first priority is to pass the puck to his line mates, he is always looking around to see where his line mates are and if they can score. Which is a skill that few young players have. He was also able to master the craft of winning faceoffs, finishing the year winning 46.9% of his faceoffs, pretty good considering he’s played the Left wing since joining the Sabres! Ennis is going to have a bright future in the league, hopefully Lind Ruff keeps him between Marcus Foligno and Drew Stafford as the chemistry and excitement between the three is amazing! The Sabres got dealt a bad hand this year in regards to injuries and that was a major factor early on in the year and at the end. But when the Sabres are healthy, they play some amazing hockey. The Buffalo Sabres team that went 20-7-5 was the healthy team that everyone expected to start the season, make the playoffs and contend for a Stanley Cup. There is a reason, the Sabres were in the pre-season talks for Stanley Cup contention, because they are a solid team with strength on defence, skill upfront and solid goaltending. When this team is healthy they are undoubtedly one of the top tier teams in the league. 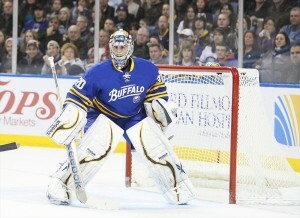 season, he came out and proved he is the same Ryan Miller who won a Vezina and an Olympic silver medal. He recorded 30 wins and joined Rangers goalie Henrik Lundqvist as the only two goalies to win at least 30 games in 7 straight seasons, he recorded a season high 6 shutouts, and passed legendary Sabres goalie Dominick Hasek becoming the all time winningest Sabres goaltender! Miller is one of the best goalies in the league he just had a rough season, if the Sabres were to trade him there would be 29 other teams in a dogfight to acquire him. The Sabres season had drama, excitement and heartbreak. Although the season didn’t end the way fans would have liked, what the Sabres were able to do near the end of the season was remarkable. At the end of the day Sabres fans should be proud of this hockey club!